Holiday libations should be three things: Easy. Festive. Not too strong. It should be a drink that can be easily mixed for guests. If I’m muddling, mixing, shaking, straining, etc. all night long, I’m annoyed. I want something with two ingredients. Tops. But, the drink still needs to feel slightly special. I never discount a good glass of wine at a party, but a drink that feels more thoughtful makes everyone more festive. And as everyone knows, holiday drinking often lasts all night – pick something that can be sipped on without making people sloppy. 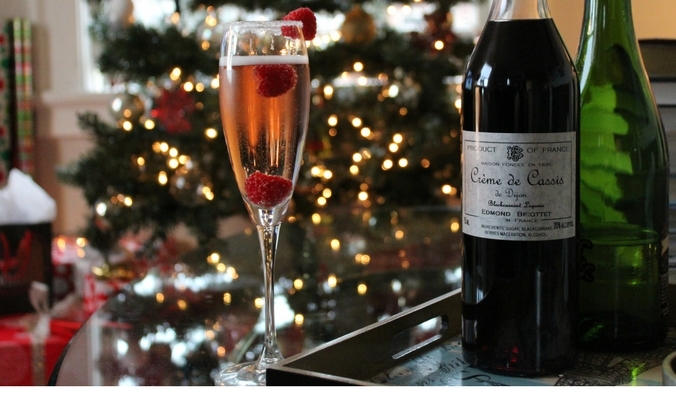 My gift to you – the Kir Royale. Born in Burgundy, the Kir Royale is traditionally an apéritif. “Royale” is a variation of the original Kir – made with Aligoté (a bone, dry, acidic white wine) and Crème de Cassis (a sweet, black currant liqueur). For a Kir Royale, the white wine is replaced with Champagne and you have yourself a fancy, festive, celebratory beverage. Add a splash (about 1 tbsp) of Crème de Cassis to a wine glass or a Champagne flute, fill the rest with Champagne (or a dry white wine – if you’re going with a traditional Kir). Add a couple raspberries, a lemon twist or a sugared rim if you’re feeling extra festive. Traditionally, the drink is made with a small amount of Crème de Cassis, giving it a light blush color and keeping it crisp and refreshing. Adding too much will give it a deep color and make it syrupy sweet. If you want to make a Kir – use a dry, acidic white wine. Aligoté is preferable, but an unoaked Chardonnay will do just the trick. Cheers to your new fav holiday cocktail. I do most things in life with a glass in my hand. Here, I write about those things, but mostly, I write about what's in my glass.